The man who invented rock & roll passed away this evening. The great Chuck Berry. He changed the face of music forever. And so I have a little Chuck Berry Story I'd like to tell you. 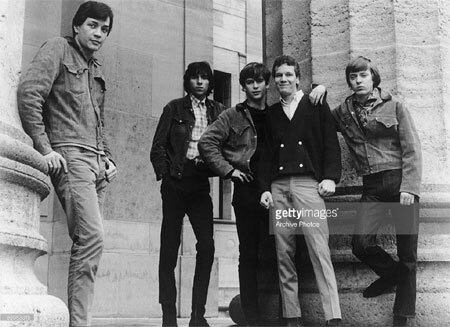 We were (Mitch Ryder And The Detroit Wheels). living in New York City, and we were booked to be on a show. The Detroit Wheels were also gonna be the house band and back up all the other acts that were on the show. Chuck Berry was the headliner. And the show was in Virginia Beach at the arena. We were so excited. So our manager borrows a car from a friend and we get one rent-a-car, and we set off from NYC at 6:00 in the morning. Were gonna drive down to Virginia Beach and rehearse with all the other groups we have to back up. The Orlons, Johnny Tillotson, The Angels, and a few others. We were just getting into Maryland and it was real foggy. Mitch, and Joe, and I were in the rent-a-car in back and McCarty and Earl and out manager and his friend were in the front car. We were coming up a T in the road with a yellow flashing light. the front car slowed down, and then they kept going straight. And we looked at each and said, what the hell are these guys doing. And they drove straight into an aluminum office building. Right up to the tail lights. We were out of minds. we thought they we dead. the whole car was scratched up. we ran up the street to a donut shop and they was Police Officer sitting inside, he came running out with us down the street to the building. Everybody in the car was alright. There were lucky. The car had be towed out of the building and taken to a dealership, were we rented another car to get to the show. We got there at noon and set up and started rehearsing with the other groups. We had to learn all the songs on the spot. The Watusi by The Orlons, and many others. The show is sold out. Were playing and no Chuck Berry yet. The Promoter is starting get nervous. We backed up all the other groups, and are waiting for Chuck. Finally the promoter yells he's here. He walks in and he doesn't have a guitar. He says where's the band that's backing me up. The Promoter says over there the Detroit Wheels. So Chuck walks up to us and says....Who's the drummer. I said, I' am. He says, you see my right foot. When I bring it down and it hits the floor you stop. OK!. OK! Chuck had a bid foot is was a size 16 Brogan Shoe. Then he asks if he can borrow a guitar. So McCarty says here use mine. At That time Jim was playing Chet Atkins Country Gentleman guitar. Chuck picked it up and put it on and the crowd was going crazy. Growing up we played a lot of Chuck Berry songs so we knew most of his stuff. So we started playing and rocking the joint. and every time we stopped. Chuck, would say something to the Audience about McCarty's guitar, Chuck says.....(I never played a guitar with so many buttons on it). The crow was eatin' it up. So we keep playing and Chuck goes out into audience and is duck walking all around, and at the end of the song, he says, (Man playing this guitar is like flyin' a spaceship). What a night! And we just kept on a rockin'....to us little kids we were havin' a ball. Playing with the man who invented rock & roll. Thank you Mr. Chuck Berry for everything you taught us. RIP! God Bless! Johnny Bee Badanjek Mitch Ryder And The Detroit Wheels.